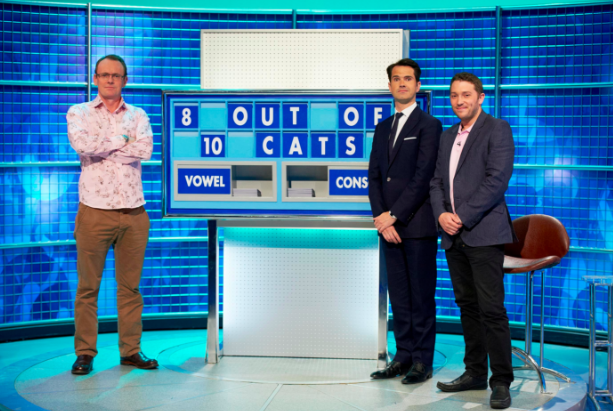 Channel 4 has announced that its popular comedy panel show 8 Out Of 10 Cats will soon return for its 19th series. Jimmy Carr will be back on hosting duties, but otherwise the irreverent show is getting a pretty big shake-up for its first proper outing since December 2014. Each episode in the twelve-part series will be aired first on More4 and repeated later on Channel 4. The most notable change, however, is that Jon Richardson and Sean Lock will be replaced by the brilliant Aisling Bea and Rob Beckett as team captains. British Comedy Guide report that Channel 4 are looking to bring their topical format to a "new generation of comedy fans" when it hits TV screens this autumn. Talking about the changes, the producers said: "Each week Jimmy, Aisling and Rob will be joined by a host of celebrities and comics, including the most promising up and coming comedy talent. Together they will thrash out the topics that have got Britain talking. As ever, they will draw on polls, statistics and surveys, pontificating on anything from Brexit to the Branjelina (sic) split." Fans of Lock and Richardson - a list in which we include ourselves - will still be getting a regular fix of the funnymen, however, as the successful spinoff quiz show 8 Out Of 10 Cats Does Countdown has been extended by a further 18 episodes. The popular comedians will stay on with Jimmy Carr for the next run, and they'll be joined by a host of celebrity guests.